Volume one of The History of England takes us from a geographical overview of prehistory through the tribal chieftain-monarchies of early England and the establishment of single ruling dynasties, up to the reign of the first Tudor monarch, Henry VII. The book is split into short, manageable chapters wherein everything is explained clearly and concisely. Presenting a general overview of a wide span of history, Ackroyd doesn’t get too bogged down with names and dates, but follows a roughly chronological narrative of the “big” events. The main players are very easy to follow, even in the earlier chapters where many Kings belonging to various regions of England, Wales and Scotland are all involved in a game of shifting borders. The narrative chronology is interspersed with shorter chapters of social history; topics such as the makeup of the household, the history of names, birth and death, toys and games etc. These chapters provide some light relief from the grand history of Kings and Queens, and are strategically placed between each change in monarch. The book itself is full of interesting facts. Like the fact that elephants and macaques roamed the landscape of primaeval Britain, yet rabbits weren’t introduced until the twelfth century. These facts often arrive as surprising little nuggets inside the main narrative: ‘In the reign of Richard II, a splendid and dangerous sovereign, the handkerchief was introduced to England.’ These playful touches appear throughout the book, which as a result boasts a lively prose style full of the unexpected. As an overview of a large span of history, not every interesting detail can be included. At some points, however, it seems as if Ackroyd tries to do just that. Occasionally, sentences–usually in the concluding paragraphs of a chapter–seem to be thrown in more so as not to be left out than because they necessarily belong there. I rather enjoyed this aspect of the book as it shows an interest in the subject matter and serves to underpin the witty, conversational narrative style, though I recognise that for others this may not be so welcome. There is a clear thread of pride in the “English way” running through this book. The early Norman rulers (William the Conqueror, William II, Henry I) all come in for a bit of a bashing, while emphasis is placed on a foundational English system of governance strong enough to withstand the petty whims of the country’s Norman rulers. 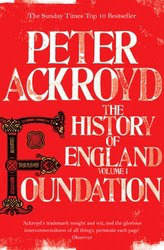 Ackroyd views the history of England, in spite of invasion and civil war, as one of gradual change. For example, the rule of law associated with the Norman kings is, for Ackroyd, the inevitable conclusion of existing structures; the infamous Domesday book is only possible due to the pre-existence of similar records on a local level. While Ackroyd’s argument isn’t too overbearing, his belief in the inherent “Englishness” of England does wash over the importance of the diversity of influences that were integral to England’s foundation as a country and as a society. Simon Schama’s A History of Britain provides a good balance to this aspect of Ackroyd’s representation should anyone be interested in a slightly different view. Overall, this book was fun to read, easy to follow, and full of strange and interesting facts.